Finding good nonfiction books for children under five is a tricky business. Granted, there are a lot of DK Publishing “visual guides” to different subjects and, when you weed out the glorified sticker books, some of them are pretty good. (We’re particularly fond of an “Oceans” book we picked up at Chicago’s Shedd Aquarium.) I’m a big believer in having lots of big, picture-filled reference works or coffee table books lying around the house, just waiting for a kid to start flipping through them. Provided that the subject matter is appropriate – “The Visual Guide to Nazi Panzer Tanks” or “Autopsies in Detroit: A History” should probably be kept on higher shelves – I think those over-sized, glossy photo books act as a really alluring windows out into the world for little kids – even though, for the most part, the text from those photo books is going to be completely lost on them, thanks to both its reading level and often miniscule font size. So it’s rare (in my limited experience) to find nonfiction works that can actually appeal to young readers in the same way as a traditional picture book, and that’s why I hold Steve Jenkins in such high regard. 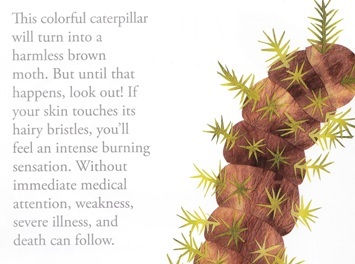 Jenkins is an artist and author who makes the coolest science books for kids you’ve ever seen. It’s probably not even accurate to call them simply “science books.” Jenkins is, first and foremost, a hell of an artist, and he creates these intricately rad paper collages to illustrate the wonders of the natural world. He’s an artist-biologist, but his picture books also have this very specific and very kid-focused way that he presents his facts, which makes them perfect for young readers. His nature books don’t read like encyclopedias – they read like books, really engaging picture books, and you can tell from even just his titles that he knows how to hook in young readers. His books include such titles as What Do You Do When Something Wants To Eat You? ; What Do You Do with a Tail Like This? ; How Many Ways Can You Catch a Fly? ; and Biggest, Strongest, Fastest; to name a few. 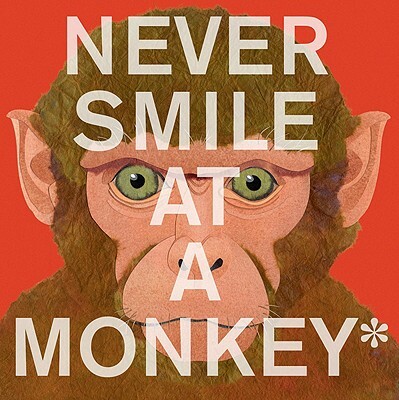 Our favorite Jenkins’ book is the amazingly-titled Never Smile at a Monkey: And 17 Other Important Things to Remember, and it’s a staple in our home library. Never Smile at a Monkey is like having your very own zoologist cluing your child in on the secret dangers of the animal world. In really smartly written text, Jenkins lets his readers know about “creatures – both large and small – whose dangerous nature might not be so obvious.” And, not only does the author tell us why they’re so dangerous, he specifically tells his readers EXACTLY what they should NEVER do if they ever encounter one of these animals in the wild – which is a GENIUS way to present this kind of information to a kid. It’s like teaching them a foreign language by starting with all the naughty words that they should never, ever say in public. The dangers of electric caterpillars. Copyright (c) 2009 by Steve Jenkins. So, we quickly learn that we should never pet a platypus (Sorry, Phineas & Ferb fans, but they have venomous spurs on their hind legs); never harass a hippo (big mouth, large tusks); never clutch a cane toad (venom sacs on its neck); never swim with a squid (tentacles, sharp beaks); and never, eversmile at a monkey (it’s a sign of aggression). It’s part biology lesson and part jungle-adventure advice and, I have to admit, my daughter listens extremely closely when we read it, as if she’s cataloging useful tips for unexpected cane toad encounters on the playground in the future. And did I mention that Jenkins’ books are beautiful? Oh man, his collages are so intricate and expressive, they almost put nature to shame. I don’t suggest that every younger child would need such edits to enjoy one of Jenkins’ books, but this was more of case of a parent knowing his individual child and knowing what would (and wouldn’t) keep her up all night. She still loved the book, even with the omissions, and, because the universe has a wicked sense of humor, now that she knows how to read, whenever I try to skip over a sentence or two when I’ve read it to her recently, she’s on me INSTANTLY – “Daddy, you didn’t read that whole thing. I KNOW you didn’t tell me all the words.” So, now she knows all the gory details and, guess what, she LOVES them. (I do, sometimes, avoid reading it at bed-time to prevent hour-long pre-sleep conversations about mortality, but, again, that’s just knowing your kid.) If you’re looking for science book for your kid that reads like literature, Steve Jenkins is the way to go. AUTHOR WEB SITE: Steve Jenkins has a very cool website, particularly a slideshow section where he explains, in detail, how he makes his books. BUY IT, BORROW IT, OR FORGET IT? : Borrow it (for starters). We love Never Smile at a Monkey, but, because of the questions of age-appropriateness and figuring out what your kid can handle, if your kid is 6 or under, I might suggest checking it out from the library first to test your audience. Gone Wild: An Endangered Animal Alphabet (2006) by David McLiman – This Caldecott Honor Book is more than just a traditional alphabet book. McLiman creates a series of wonderfully iconic black and white illustrations of endangered animals posing as letters of the alphabet and, while it’s not as clever or engaging as Never Smile, it shares Jenkins’ focus on zoology, giving many details about each endangered animal along with other resources to learn more about their plight. Bruno Munari’s Zoo (2005) by Bruno Munari – Another gorgeous look at the animal kingdom, structured around a zoo, created by Bruno Munari, a legendary Italian artist and graphic designer who counts kid-lit legends like Eric Carle among his admirers. More of a charming art book than a work of zoology, but fans of Jenkins’ animal collages will find a lot to like here. Any other Steve Jenkins picture book. Honestly, he really is creating some of the most engaging books on zoology for young readers these days. If you started with Never Smile at a Monkey, why not try How to Clean a Hippopotamus: A Look at Unusual Animal Partnerships (2010) by Robin Page and Steve Jenkins next? Know a good book that any kid should have in their library? EMAIL ME! Read What I’m Doing on Brightly! I'm also writing kidlit book recommendations and articles for an amazing site called Brightly -- click here for my article archive!